The first-ever Prague Cup was held last Saturday, November 5th, with two new sides in the Finland and Czech Lions taking to the field against the German Lions of Düsseldorf. In a three-game tournament, the Germans came out on top, defeating the Czech Lions 48-15 then combining with the Finns for a social third match against the Czechs. In a tight first game for both sides, the Finnish Lions triumphed over the chilly conditions with a tough four-point win over the Czech Lions. In the second match, the Czechs ran out of legs, being eventually well-beaten by the German visitors. The weekend was a great success for the teams socially and organisers hope to be able to host the event again next year. 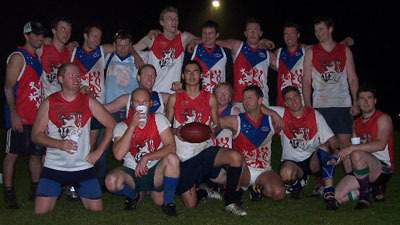 For the footy trivia-fans among us, the event was possibly the first-ever footy tournament where all teams wore jumpers essentially created a banner form of local coat of arms, the Finnish and Czech national symbols being Lions, as is the city arms of Düsseldorf. Any trivia-minded footy fans who can suggest when else this has happened drop us a line! 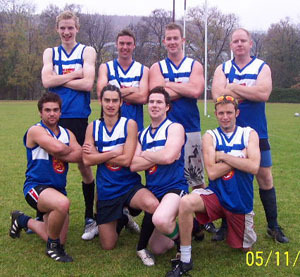 For more information on footy in the Czech Republic, visit the Czech Australian and New Zealand Association website.